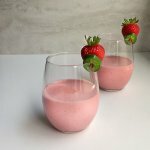 This Strawberry Smoothie recipe is made with greek yogurt and gets a spicy kick from a jalapeño. Refreshing and delicious! A Strawberry Smoothie recipe that included jalapeños probably isn’t something I would’ve thought to make on my own. However, I’m glad I discovered this delicious pairing of flavors! It’s been getting warmer by the day, and ice cream is something that has been sounding really good lately. There’s a local restaurant here in McKinney called Nom Noms Mexican Grill and Chill that makes its own ice cream. They had some pretty good reviews on Yelp, so we decided to try their ice cream out one afternoon. There were some out of the ordinary flavor combinations available. I spotted a strawberry jalapeño ice cream in the case and asked for a taste. I don’t normally ask for a sample, but there was no way I was getting a whole scoop of that one without trying. Surprisingly, it was really good. You could taste both the strawberries and jalapeños, and it had a kick of heat that I could feel in the back of my throat. So good! Right then and there, I thought about making a smoothie version of the ice cream. Something with less sugar, organic ingredients and with some added protein. I like using greek yogurt in my smoothies for the thickness and protein value it adds. You can leave out all of the seeds of the jalapeño or add in however many you like to get the heat level you want. Personally, I like the bit of kick they add to the drink. This Strawberry Smoothie features a spicy kick from a jalapeño and is made with greek yogurt. A refreshing and delicious snack! Place all of the ingredients into a blender, blend until smooth, then serve right away. By Tempie at March 2, 2018 .